There aren’t many things out there that we can genuinely say we never tire of experiencing. One of them has to be spying a sleek dorsal fin cutting through the water’s surface – no matter if it is your first, or five hundredth, encounter! There are many perks to my job as a PADI scuba diving instructor here at Simply Diving Marbella. Being joined by a pod of dolphins en route to a dive site is undoubtedly a favourite. Marine mammals, and in particular cetaceans (whales and dolphins), are known for their complex social interactions and phenomenal feats of intelligence. So much so, that these beautiful creatures have a formally recognised Declaration of Rights! 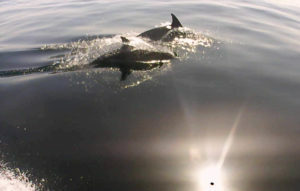 Here on the Costa del Sol, where the currents thundering through the straits of Gibraltar bring in nutrient-rich waters, we frequently come across not one, but three different dolphin species: the Common Bottlenose Dolphin, the Short-beaked Common Dolphin and, last but not least, the Striped Dolphin. 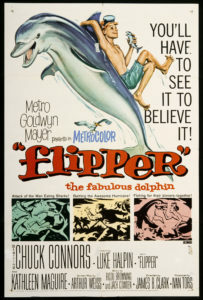 The Common Bottlenose Dolphin (Tursiops truncates), named after the uncanny resemblance of their snout to an old fashioned gin bottle, is possibly the most well-recognised of all dolphin species, not least as a result of television programmes like “Flipper”. The pure joy of seeing these beautiful animals swimming wild in their natural environment, as opposed to performing a few tricks on television or in the confines of a dolphin show, takes your breath away and hopefully will lead to a lifelong love affair with these wild marine mammals. They have been known to grow upwards of two metres in length and weigh an impressive 200-400 kilograms. Most of this mass is muscle, so it’s no surprise that they can keep up with our RIB on the way to our favourite dive site and play in our trailing waves. The Short-beaked Common Dolphin (Delphinus delphis) is also well known to us as a travel companion to and from sites like Las Bovedas, Boloñes de Banus and El Pimpollo. These slender cetaceans have a striking hourglass colouration pattern, with a dark dorsal back, a light grey flank and a white abdomen, with yellow markings either side of their head, making them easily distinguishable from most other marine friends. 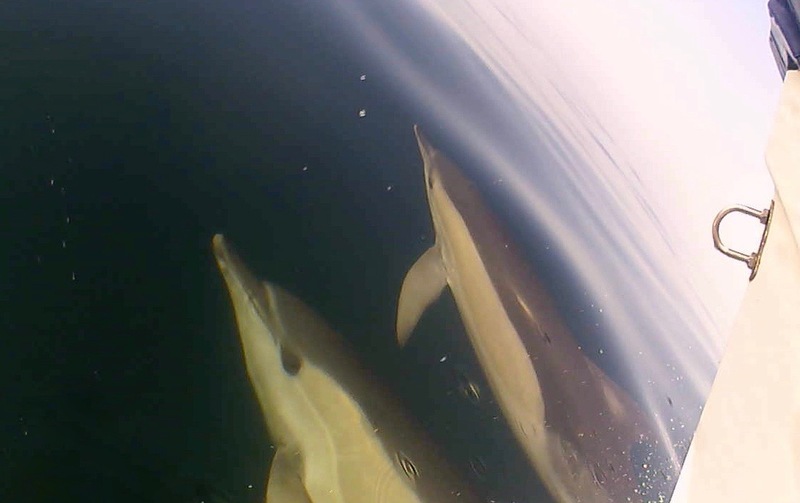 If you spy one of these cetaceans, be sure to keep your eyes peeled for more, as Short-beaked Common Dolphins aggregate in large numbers and are often found playing in the surf or travelling in large pods. Finally, we have the Striped Dolphin (Stenella coeruleoalba). At first glance it can be quite difficult to tell the difference between them and the Short-beaked Common Dolphin as they too have a prominent patterning across their flank. But on closer inspection, you’ll notice that Striped Dolphins have distinct light grey stripes of colour stretching from their white abdomen across their dark blue-grey back. These dolphins are known for being particularly energetic at the surface and if you’re lucky, you may even see them perform their characteristic “roto-tailing” behaviour, where they jump and spin their bodies rapidly above the surface. Quite a sight to see! It’s currently mating season for all of these dolphins so we at Simply Diving are excitedly waiting for the first sight of the wild pods’ newest additions. Next time you’re with us on the RIB, be sure to keep your eyes on the horizon for a dorsal fin or two! Courtney is an English and French speaking South African marine biologist, who grew up in the Czech Republic and spent her childhood exploring the sea as a young diver. As a PADI Instructor, she is now able to share her love of all things that wriggle in the sea with anyone who is willing to listen and learn. How fascinating! I love seeing the sea through your eyes. I can only imagine it’s a great experience to see dolphins while diving. Thank you so much Georgia for your lovely comments! It’s certainly an unforgettable experience and a wonderful chance to get a little insight into the amazing world beneath the surface. What a beautiful piece of writing! I remember my first bottlenose encounter back in 2010 – I’ve never looked back. It was one of the most captivating moments I’ve ever experienced and now, here I am working as a marine mammal research scientist feeling so grateful for a boat trip that changed everything! Anything you guys can do to foster a love of these animals is really important for protecting them. Keep doing what you’re doing Simply Diving!